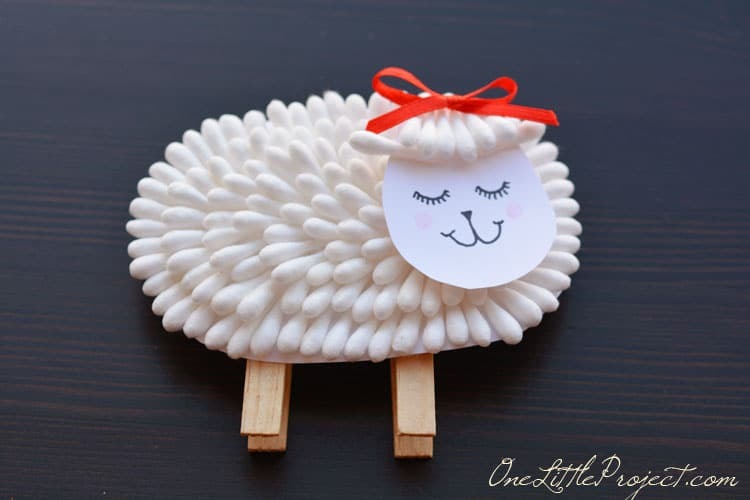 Whether you’re looking for projects to celebrate Spring or Easter your child is going to have a lot of fun with these adorable sheep crafts for kids of all ages! Have you ever heard that saying that March comes in like a lion and goes out like a lamb? The lion part has been pretty true this year with all the snow we’ve had, so I’m keeping my fingers crossed that Spring will be here in a few weeks! 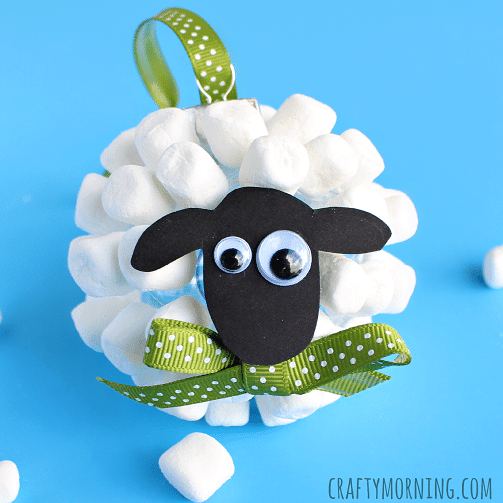 But the quote also inspired me to round up some sheep crafts for kids for you today as part of the Easter crafts for kids collection. As always there is something here for budding crafters of all ages, from toddlers and preschoolers right through to tweens and teens. So grab your kid’s craft box and let’s get started! This cute little lamb is made using Q-tips. Make a whole family of lambs so you can set them up in a display on your mantel, or use them as place cards for Easter lunch. This is a simple craft to make but your child will need a bit of fine motor dexterity to line the Q-tip ends up straight. It’s great for preschoolers and older, but even toddlers would have fun giving it a try! I’ve heard of potato stamping and wine cork stamping but this is the first time I’ve ever seen a project that uses a loofah to stamp with! You can make a field full of these sheep just for the fun of it, or you could make adorable cards for friends and family. This painting activity is perfect for toddlers but preschoolers would have fun with it too. How cute is this little guy! I love those clothes pin legs too. 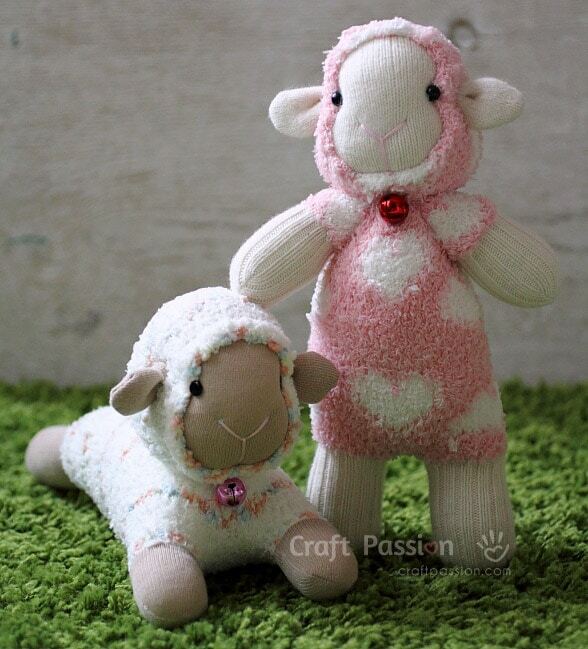 You could use these sheep for creative play or singing since the little legs allow them to stand up. You might be wondering why I’m including a Christmas ornament craft in an Easter collection but I was just reading in the newspaper today about Easter trees so I thought why not? If you don’t have a tree you could use these to decorate your mantel instead, they’d look super cute as a garland! Top tip: Make sure you have more marshmallows than you could possibly need to cover the ornament… because you know some will get eaten along the way! 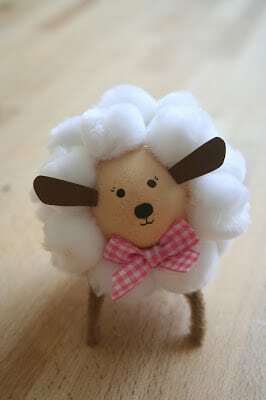 If you are looking for ideas for egg decorating then take a look at this adorable little sheep! If you don’t have any white pompoms you could use cotton wool balls instead. Paper plates are a great thing to keep in your kid’s craft box because they’re cheap and you can do so many things with them. Like turn them into a sheep! 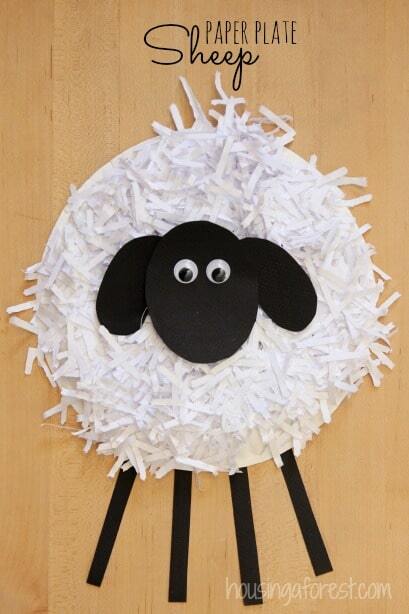 This sheep craft is perfect if you have a shredder full of paper you need to dispose of, instead of recycling it let your kids have some crafty fun instead. This craft project is perfect for toddlers and preschoolers. 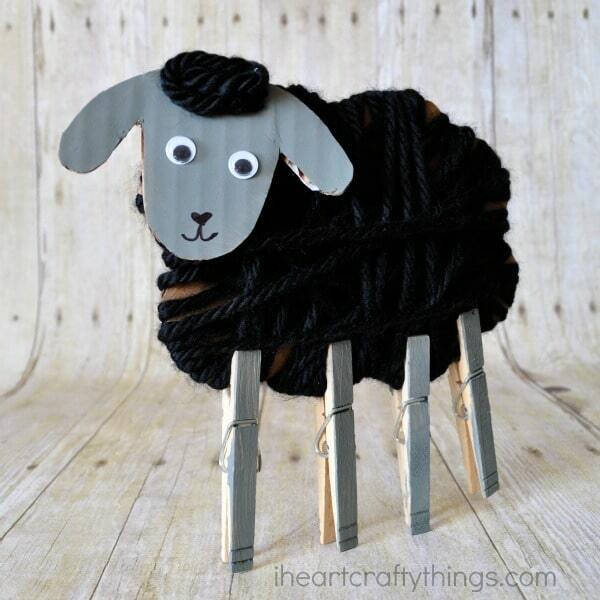 It’s one of those crafts where the more haphazard you are the better the sheep looks! Be warned, that shredded paper crafts are messy, so cover your work area as best you can and have the dustpan and brush close by! This one is definitely a project for an older child. Teens will be able to make them on their own, and your tweens might need just a little help from you. You can use a sewing machine to sew these little guys up more quickly, or just sew them by hand. Your little paper crafter will love this origami bookmark. Folding corner bookmarks is a lot of fun and once you master the art your child can make a whole pile of them in no time, making this a great craft for Easter gifts for their classmates. Your child will need patience and precision for this one so it’s probably best suited to First Graders and older. 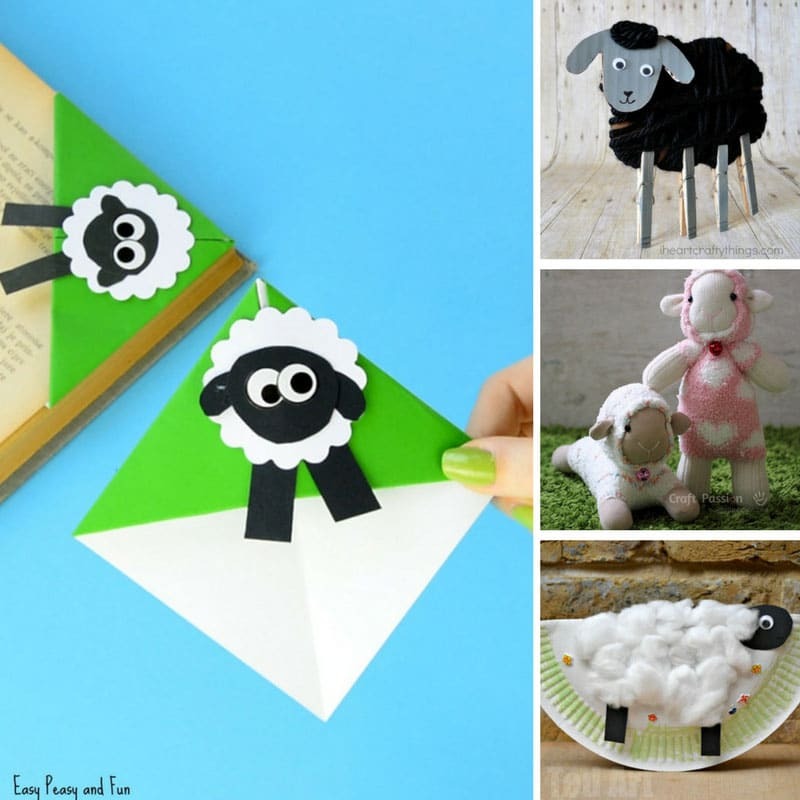 If you have younger children who want to join in the crafting session then pre-fold the bookmark and cut out the sheep pieces so they can just stick it all together. 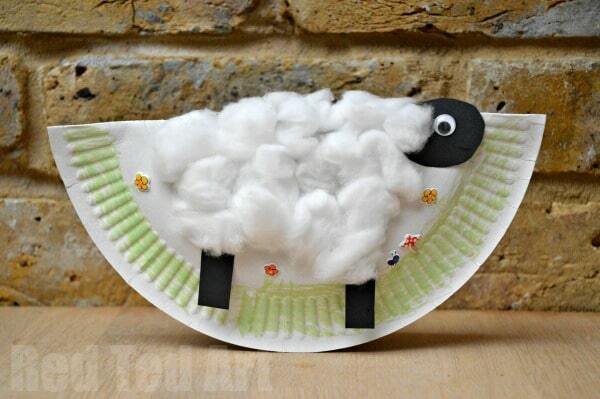 This is a super easy paper plate project for your child to make a little sheep that actually rocks back and forth! 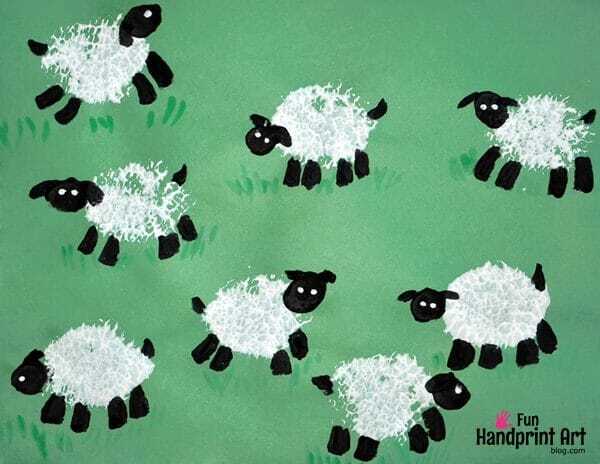 Why not craft up a whole flock of sheep for some fun small world imaginary play with songs or story telling. This craft is perfect for toddlers and preschoolers. 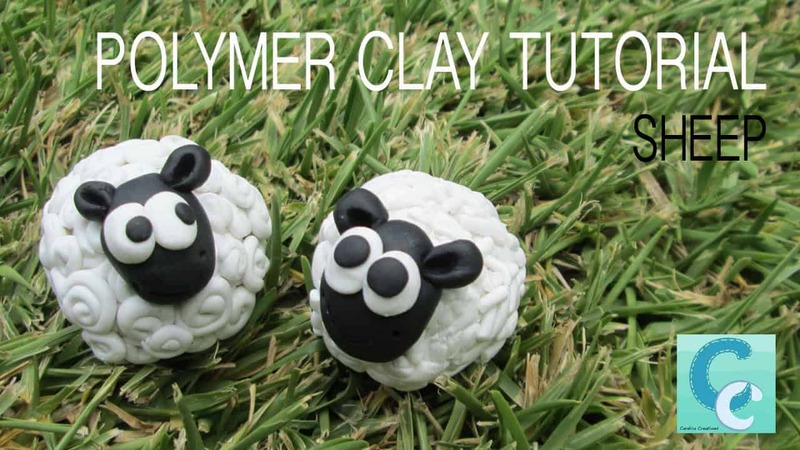 This is a video tutorial which will show you and your child how to make a cute little sheep using Fimo soft polymer clay. They’d look cute on your mantel as part of your Spring or Easter decor. This project is probably best suited for First grade and up, and is something teens would enjoy. Previous PostPrevious Easy DIY Burlap Wreaths That Will Make Your Neighbors Jealous!